Two snub-nosed monkeys are pictured resting on a stone and staring intently into the distance. What are they looking at, and what are they thinking? It turns out they are watching a big barney between members of their troop. This image of apparent serenity versus commotion is the overall winner of the 2018 Wildlife Photographer of the Year competition, announced at a gala dinner at London’s Natural History Museum. The picture was taken by Marsel van Oosten in China’s Qinling Mountains. The Dutchman had to follow the troop for many days to understand the animals’ dynamics and predict their behaviour. 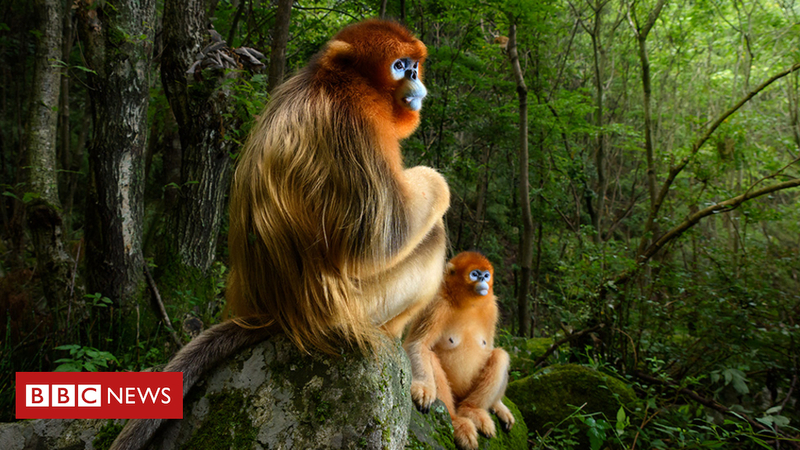 His goal was to show in one shot the beautiful hair on a male snub-nosed monkey’s back, and the creature’s blue face. Marsel’s perseverance eventually paid off with this exquisite composition that includes a smaller female behind. The photographer told BBC News he was “shocked and honoured” to receive the award. “I am happy that it is with this particular image because it is an endangered species and one that very few people even know exists and it is important that we realise that there are a lot of species on this planet that are under threat. 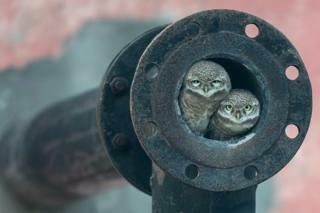 The image is not showy or shocking as WPY winners sometimes are. But there is something enthralling there that pulls you in, says Roz Kidman Cox, the chair of the competition’s judges. “As we were going through the entries, we just kept coming back to this one,” she recalls. “It’s almost like a stage set. I think what makes it are the colours and the lighting. 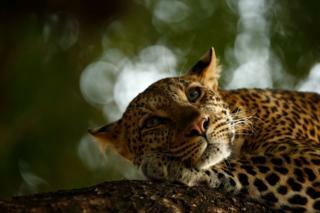 The junior winner this year is Skye Meaker from South Africa for his picture of a dozy leopard in Botswana’s Mashatu Game Reserve. The animal is well known and goes by the name of Mathoja, which in the Bantu language means “the one that walks with a limp”. The leopard broke a leg as a juvenile. It survives but has to fight hard because unlike other big cats it cannot pull dead prey into the trees to eat it, says Skye. That means eating on the ground where hyenas are always trying to pinch a kill. As well as his grand title, 16-year-old Skye wins the 15-17 Years Old category. Animals In Their Environment category – Cristobal Serrano from Spain took this shot of crabeater seals resting on an ice floe off the Antarctic Peninsula. 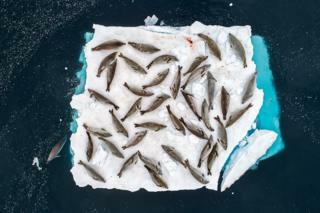 The seals have a close relationship with the sea-ice because it is the habitat that provides shelter and food (algae) for krill, tiny crustaceans. And it is the krill that are the main food source for the seals. 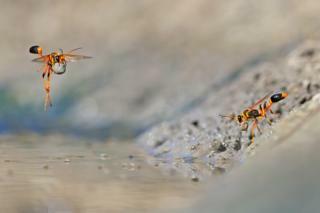 Behaviour: Invertebrates category – Georgina Steytler took this picture of mud-dauber wasps in Walyormouring Nature Reserve in Western Australia by getting down to their level. In the mud. “I just got down in it with a long lens, taking shot after shot. I wanted to get one of the wasps carrying a mud ball, and to get two was incredible. It’s luck but you have to be in the right place at the right time with the right equipment.” The wasps use the balls to build nest chambers where they lay eggs on the paralysed bodies of spiders. 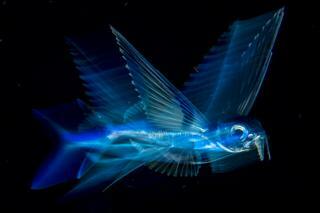 Underwater category – This is a flying fish captured in the lens of American photographer Michael Patrick O’Neill. It was taken during a night dive off Florida’s Palm Beach. These fish are very timid during the day but at night are easier to approach. Michael tried various camera and light settings to get this other worldly impression of the animal. Wildlife Photojournalism category – This shocking image of a street monkey was taken by Joan de la Malla on the island of Java, Indonesia. 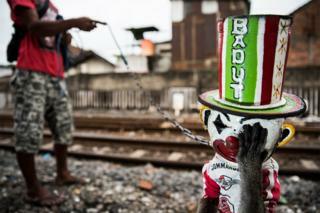 It is a macaque that has been forced to wear a clown’s mask. “It is painful and the macaque has its hand up to try to remove it,” says Joan. The Spanish photographer has been working with animal welfare groups to try to get this type of street performance shut down. In the last couple of weeks, this has happened; and this particular animal, known as Timbul, is heading back to the wild. Wildlife Photographer Portfolio category – Javier Aznar González de Rueda, another Spanish photographer, entered a series of images, with this one featuring the Alchisme treehopper. The picture, taken in the El Jardín de los Sueños reserve in Ecuador, shows a mother guarding her nymphs. 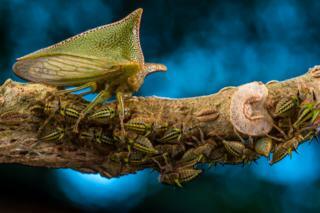 A treehopper will lay her eggs on the underside of a nightshade leaf and then cover them with a thin secretion. Once the eggs hatch, they develop through five nymphal stages, differing in size, colour and ornamentation. Behaviour, Amphibians and Reptiles category – A Hellbender salamander holds a northern water snake in its jaws in this photo taken in Tennessee’s Tellico River. 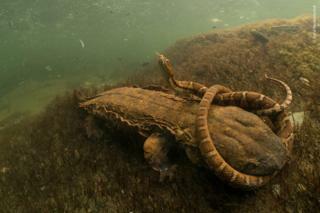 David Herasimtschuk says the snake eventually managed to escape after wrestling with North America’s largest aquatic salamander. 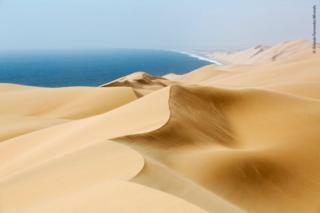 Earth’s Environments category – The top of a high dune on Namibia’s desert Skeleton Coast, where mounds of wind-sculpted sand merge with crashing Atlantic waves. Look closer and you will see the fog that often forms in this region of Africa. As the fog drifts inland it delivers life-sustaining moisture to plants and insects. WPY is one of the most prestigious competitions of its type in world photography. Started in 1964, the competition is now organised by London’s Natural History Museum. An exhibition of the best images opens at the South Kensington institution on Friday. Next year’s competition starts taking entries from Monday.